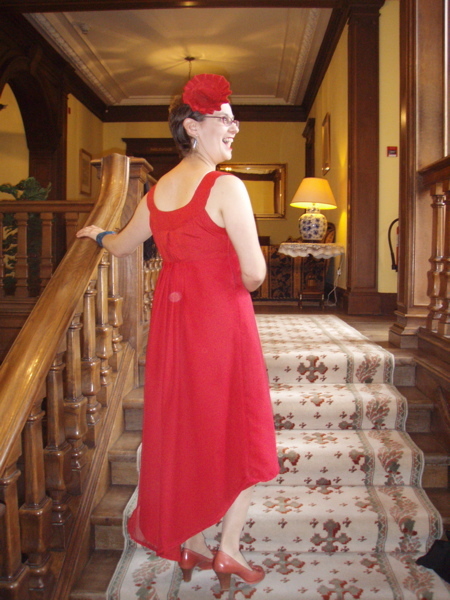 This is my red dress made to wear to a wedding at the weekend. Back story to the dress here. Despite all my plans, I seriously ran out of time to make the dress in the way I intended. Lack of time conspired with lack of concentration (working on it late at night after 12 hours or so work isn’t ideal) and I managed to cut the front panel on the straight instead of the bias, and failed to work out a way to avoid the CF seam. Working with polyester chiffon was predictably horrible and I’m not too happy with the way the dress hangs at the front. The reason I was working with poly chiffon was because I bought 10 metres of it last year, by mistake. Typically, I actually used very little of the masses of chiffon, because there simply wasn’t time to wrestle it properly, and I ended up using a couple of metres of bog-standard poly-cotton sheeting. Hmm. Not my finest effort, but it looks ok in the photos. I’m really pleased with the pleating I did on the back. I’ll have to take photos of that on a mannequin. 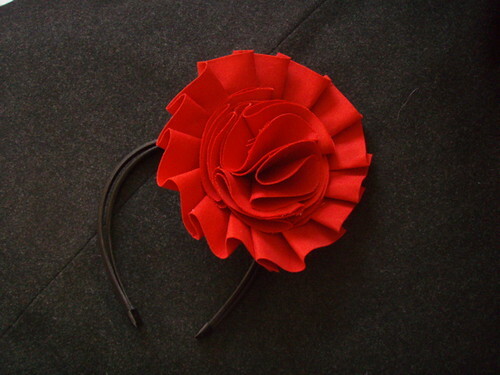 I also made this huge flower on a headband to go with it. That wasn’t what I intended either, but it was suitably mad and colourful and entertained the guests. As did me falling over when leaning back on an ottoman for a better view of the bride and discovering it was on wheels. Embarrassing heap on the floor, just as bride comes in. Excellent. I’m still achey from the combination of excess ceilidh dancing and 12 hours on the bus to come home, but it was a fabulous and joyful occasion. 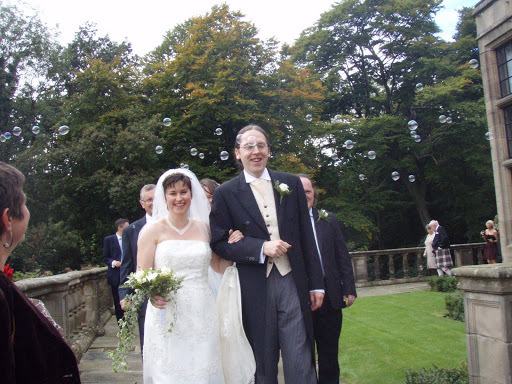 The two friends who (finally) wed were on my MA course, where we all met 12 years ago. It took them 5 years to get together and another 7 to get married, so this was a long anticipated and very happy occasion. 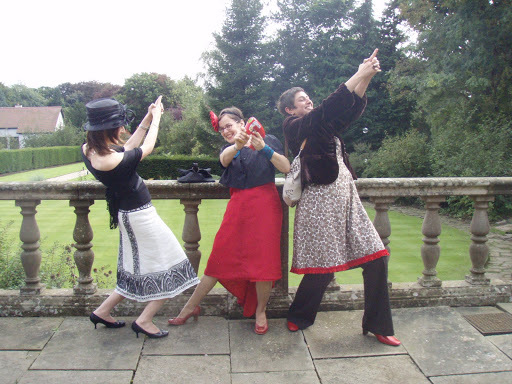 And not without the opportunities for immense silliness with my friends. You look fab, a very elegant wedding, somebody has to fall over so at least you saved the bride or mother from doing it! What absolute fun, and your dress is really beautiful…LOVE the headband, too! !